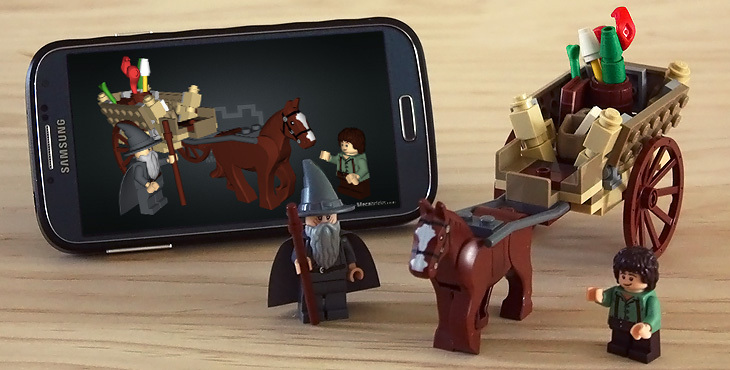 Mineways lets you export your Minecraft creations into files you can use for making images, movies, or 3D prints. It is a free, open-source program for exporting your Minecraft models for 3D printing on your own printer or through a service such as Shapeways or Sculpteo, viewing on the web through Sketchfab, and rendering with Blender, 3DS MAX, Maya, Cinema 4D, or other rendering system. The latest Windows version is 5.09; for Mac it's version 5.04, 32-bit only (read the notes for the Mac). For Linux, use WINE to emulate Windows. Minecraft is a computer game that randomly generates infinite worlds made up of cubic blocks of various materials, with each block being 1x1x1 meter. There are rules that govern how the world works, but no set goals. Generally you mine the materials from the world, combine ("craft") them into blocks, and place each block in the world to build structures, all using an in-game character that moves like it would in a first-person shooter game. You can play in worlds on your own computer, or with other players on multiplayer servers. A crafting example from the Minecraft wiki. The game has become quite popular over the past few months. The single Swedish programmer who is developing it has it has over 400,000 paying customers and has made over five million dollars on it so far. And it is only in an "alpha" state! From my perspective, I find that it appeals to that part of you that loves LEGO, model trains, or building sand castles and pillow forts. I also find it very liberating to be limited to cubes, which sounds ironic. If I had more elaborate or complex tools to build with, the learning curve would discourage me from building something interesting. Only having cubes, I feel much more inclined to dive in and start building. 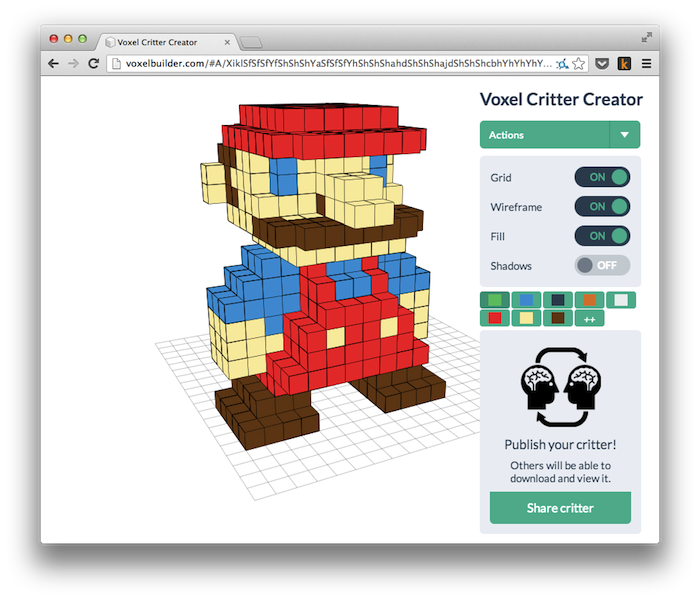 Use the Builder to create and edit voxel (AKA cube) models. 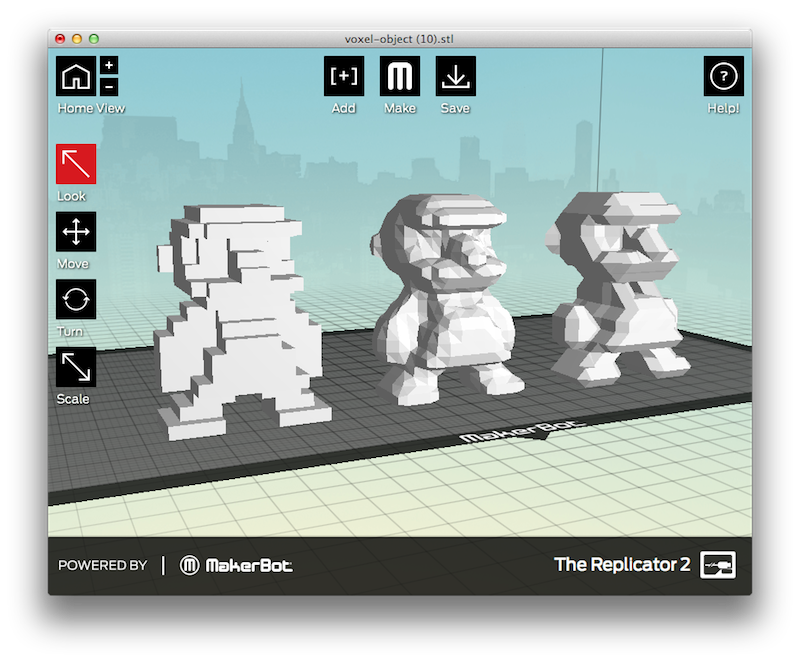 You can manufacture your critter using either a 2D printer or a 3D printer. Visit this page and drop your critter PNG onto it to generate pages. Print the pages so that each layer is a different page on a color printer. Then use scissors and glue to assemble each layer! Visit this page and drop your critter PNG onto it to generate a 3D printable STL file. The above shows three STL files loaded into MakerWare: unsmoothed, smoothed with surface nets and smoothed with marching cubes. Here are the 3 variations of Mario printed out by @vladikoff at the Mozilla San Francisco office. You can view more photos from his print here. Thanks, Vlad! 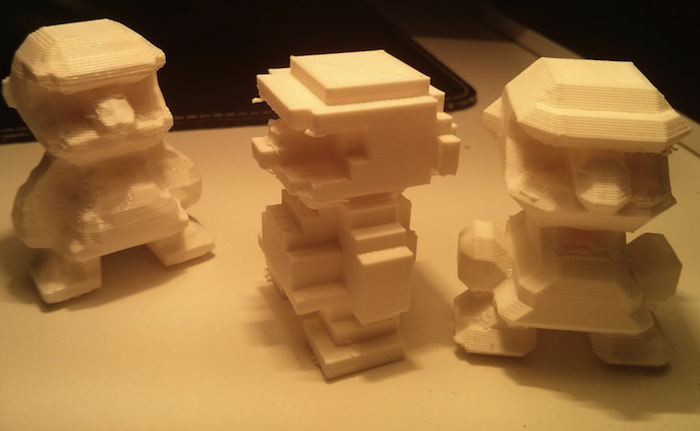 Mikola Lysenko, the designer of the Mario model and author of many of the algorithms in Voxel Builder, also wrote a post about the process of creating the 3D mario.